A new composite image of the galaxy cluster Abell 1033 bears a striking resemblance to the Starship Enterprise from Star Trek. 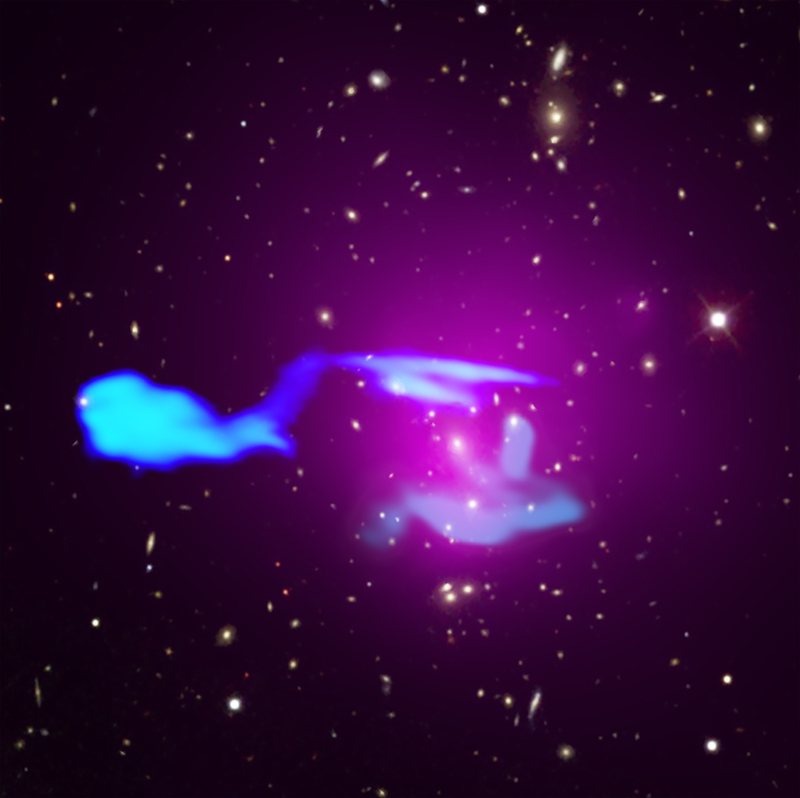 X-rays from Chandra (purple), radio emission from LOFAR (blue), and SDSS optical data were combined in this image. Abell 1033 is a merger of two galaxy clusters, the largest structures in the Universe held together by gravity. Pareidolia is the phenomenon where people see familiar shapes and patterns in otherwise random data. In Abell 1033, the collision has interacted with another energetic cosmic process — the production of jets of high-speed particles by matter spiraling into a supermassive black hole, in this case one located in a galaxy in one of the clusters. These jets are revealed by radio emission to the left and right sides of the image. The radio emission is produced by electrons spiraling around magnetic field lines, a process called synchrotron emission. A paper describing this result was published in the October 4th, 2017 issue of Science Advances and is available online. The authors of the paper are Francesco de Gasperin, Huib Intema, Timothy Shimwell (Leiden University, the Netherlands), Gianfranco Brunetti (Institute of Radio Astronomy, Italy), Marcus Bruggen (University of Hamburg, Germany), Torsten Enblin (Max Planck Institute for Astrophysics, Germany), Reinout van Weeren (Leiden), Annalisa Bonafede (Hamburg), and Huub Rottgering (Leiden). The merger of two clusters of galaxies. About 1.62 billion light years from Earth. Combines X-rays from Chandra X-ray Observatory, radio data from LOFAR, and optical data from SDSS. About 3.3 million light years across. X-rays are pink. Optical is red, green, and blue. Radio is blue.